Find hotel near Wat Chakrawatrachawat Wor ..
Wat Chakrawatrachawat Woramahawihan is a Buddhist temple in Bangkok that is also fondly called the Crocodile Temple because the three live crocodiles that preside over the crowded grounds. This 19th century temple is also known for its beautiful temple architecture that features colourful, traditionally places glass pieces and murals. This temple was once the royal temple and is today one of the largest settlements for monks and novices in Bangkok. The Buddha shrine features a gold-leaf-covered image that is seated with feet on the floor in the “forest retreat” posture. Right next to the temple is a pond that houses three large crocodiles. Located near the Chinatown, this temple offers its visitors an opportunity to get a closer look at a monks’ way of living. Visit early in the morning before the crowd starts to come in. A fun-filled day in the city is possible with these exciting Bangkok tours that you can book for your visit. Use Bangkok trip planner to visit Wat Chakrawatrachawat Woramahawihan and many others to your visit. Add comfortable hotels to your plan, choose from the recommended hotels in Bangkok like Ibis Bangkok Riverside, Kokotel Bangkok Surawong, Holiday Inn Express Bangkok Sathorn and Marvin Suites. Choose from variety of exclusive Bangkok vacation packages for your next visit or create own own. Check out the various options for how to reach Bangkok and finish off your vacation package by booking the ideal transfer. Maintain silence once inside the temple. How popular is Wat Chakrawatrachawat Woramahawihan? 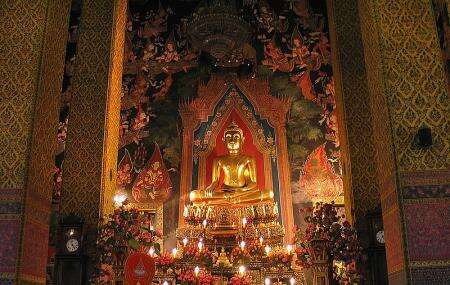 People normally club together Tip Samai and Wat Pho Thong while planning their visit to Wat Chakrawatrachawat Woramahawihan. When I went it was mostly closed up. I still got to look around most of it. There are these large towers which were cool and unexpected, though you can not enter them. There are also crocodiles in an enclosure. It is cool but probably not as impressive as you might think it would be. Beautiful temple Wat Emerald Temple The royal monastery is in the center of the city. Neighborhood Not far from Yaowarat Road. Thai-Chinese border The business district, however, to this day. People are not aware that many people know the temple was famous in Thailand, but before the present era is a true bestseller. It is a special one. The temple is full of joy. This temple is beautiful to look like a temple. Architecture in the Khmer era. Inside the temple is a painting by a painter. Tells the story of the goddess Vessel. There are many things in the temple to praise you. The temple is in the business district. You have no car parked enough in this temple, but .... Free parking is not in the world and then. Everything for money in religious affairs. I think it's a good idea. There were two baby crocs that were sleeping mid day. There is so e decent swag to see. Worth a visit if you are in the area. One of my favorite places during my visit in Bangkok. I could observe monks chanting and praying inside. A must see! Very calm and enlightening place. See the crocodiles!